You just bought a new pair of shoes! Despite the excitement of its first debut, the breaking in period can be daunting. If you were smart in your shoe choice, this may not be as painful for you but here are some tips and tricks to make those brand new shoes feel like you’ve had them for years! ​Line the inside of your shoe with soft, comfortable material! 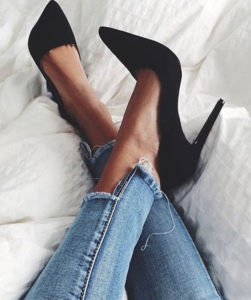 This will help cushion your feet and make wearing heels bearable. No more slips and falls! Slip on your thickest pair of socks and walk around in your shoes. This will also help stretch out the material. Try out some of these shoe hacks and walk more comfortably! For advice on shoes and all things related to feet, come visit one of our friendly podiatrists at Podiatry HQ!